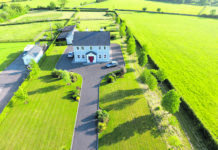 Killeely Beg in Kilcolgan is an exceptional five-bed detached home that has been designed to a high standard seldom seen on offer to the market. Constructed in 2012, the property is offered in turn-key condition with quality throughout an boasting an A3 energy efficient rating. Arranged over two storeys, the property offers an abundance of living and reception space, as well as five large bedrooms, four with en suite. The high specification is immediately evident with notable features throughout such as triple glazing windows, under-floor heating over both storeys, temperature controllers in all rooms, heat recovery system, solar panels, designer tiling throughout, Italian fitted kitchen and utility with integrated appliances, as well as electronic gates with intercom and alarm. The property spans 266.55 square metres on a half-acre site. Downstairs comprises a beautiful entrance hall which avails of high ceilings and natural sunlight. From there, the property leads into the magnificent open plan kitchen and living areas. The meticulous design is ever apparent in this area with integrated quality fittings and appliances, including an ‘Insinkerator’ (instant hot water tap) and an abundance of storage space, including a walk-in pantry. The open-plan area also offers ample dining and living space, which includes an insert stove, and leads into the sun room. The remainder of the ground floor is completed with a fully-fitted utility room, separate living room with an additional insert stove, and a downstairs bedrooms with fully fitted en suite.